Back to the Future Part II is a 1989 American comic science fiction film directed by Robert Zemeckis and written by Bob Gale. It is the sequel to the 1985 film Back to the Future and the second installment in the Back to the Future trilogy. The film stars Michael J. Fox, Christopher Lloyd, Thomas F. Wilson and Lea Thompson and continues immediately following the original film. After repairing the damage to history done by his previous time travel adventures, Marty McFly (Fox) and his friend Dr. Emmett "Doc" Brown (Lloyd) travel to 2015 to prevent McFly's future son from ending up imprisoned. 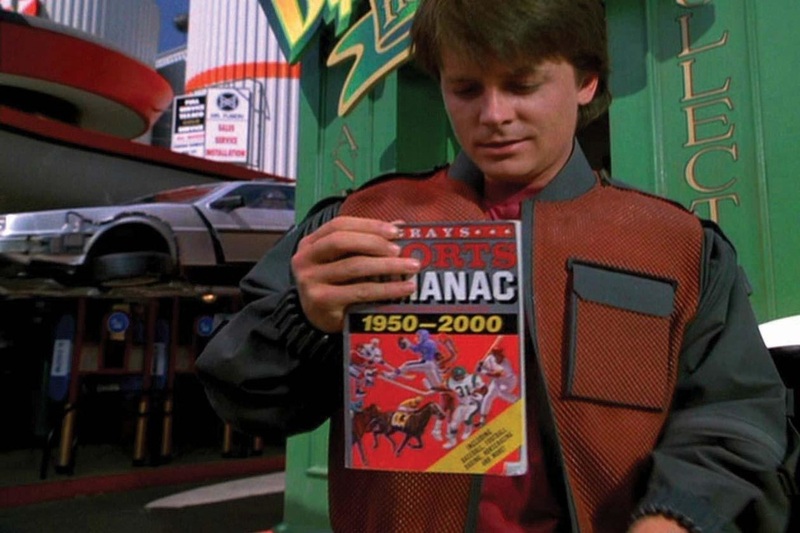 However, their presence allows Biff Tannen (Wilson) to steal Doc's DeLorean time machine and travel to 1955, where he alters history by making his younger self wealthy. A brief joke has the Chicago Cubs winning the 2015 World Series over a Miami-based team whose logo was depicted in the film as an alligator, given both the long title drought of the Cubs and the fact that at the time, no Major League Baseball team was located in Florida. The state of Florida has since gained two franchises: the Florida Marlins (now the Miami Marlins) in 1993 and the Tampa Bay Devil Rays (now the Tampa Bay Rays) in 1998. (The Marlins, like the Cubs, are a member franchise of the National League (NL), making it an impossibility that the two franchises would play each other in the World Series.) In the actual 2015 season, neither Florida-based team qualified for the postseason, but the Cubs clinched a berth in the NL Wild Card Game, marking their first postseason appearance since 2008. The Cubs won 4-0 at Pittsburgh to advance to the 2015 National League Division Series against their chief rival and Central Division champions, the St. Louis Cardinals, which they won, three games to one.